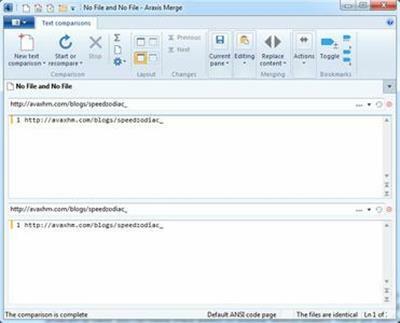 Araxis Merge is the two- and three-way visual file comparison/merging and folder synchronization application. Use it to compare, understand and combine different versions of source code, Web pages and other text files, or even text copied and pasted from another application (e.g., Pages or Microsoft Word). Merge integrates with Time Machine, so you can compare older versions of files..
Araxis Merge 2017 - Take control. Be productive. Join tens of thousands of other pros using Araxis software. Araxis Merge is a software program that has been created specifically in order to help you visually compare, merge and synchronize text files and folders. Araxis Merge 2016 - Take control. Be productive. Join tens of thousands of other pros using Araxis software. Araxis Merge is a software program that has been created specifically in order to help you visually compare, merge and synchronize text files and folders. 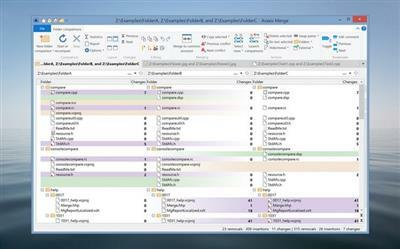 Merge is the visual file comparison (diff), merging and folder synchronization application from Araxis. 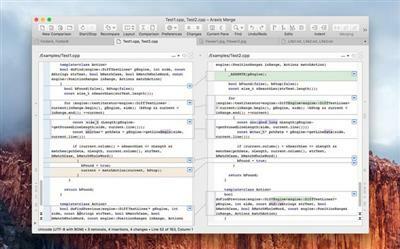 Use it to compare and merge source code, web pages, XML and other text files with native application performance. Directly open and compare the text from Microsoft Office (Word and Excel), OpenDocument, PDF and RTF files. Compare images and binary files. Synchronize folders. Perform code reviews and audits. Work with folder hierarchies containing thousands of files.